This might be a little silly (or a bit TMI) for some folks, but I think it’s cute. When I was at SNAP! I saw spoons that had been hammered flat and had text hammered into them. (I cannot remember the vendor that had them, so sorry.) I think they were designed to be little plant or garden markers. Anyhow, a few weeks later I saw a big bin of spoons at my local Goodwill and found two that I thought had a kind of cool design on them. And for .29 cents a piece, why not? The colors I used match our bedroom, but obviously, you could choose whatever like. If you wanted to, you could also make this work for the kitchen. I took an old frame that I had laying around and spray painted it silver. I played around with the placement of the spoons and the contact paper letters. At the end of the day, I thought our names made it too busy and opted to leave them off of the project. Apply the paint, making sure your brush strokes go in one direction only. (I chose side to side, horizontally.) When the paint is set (but not totally dry) go ahead and carefully start peeling up the letters. I used the tip of an exacto knife and tweezers to pull them off. 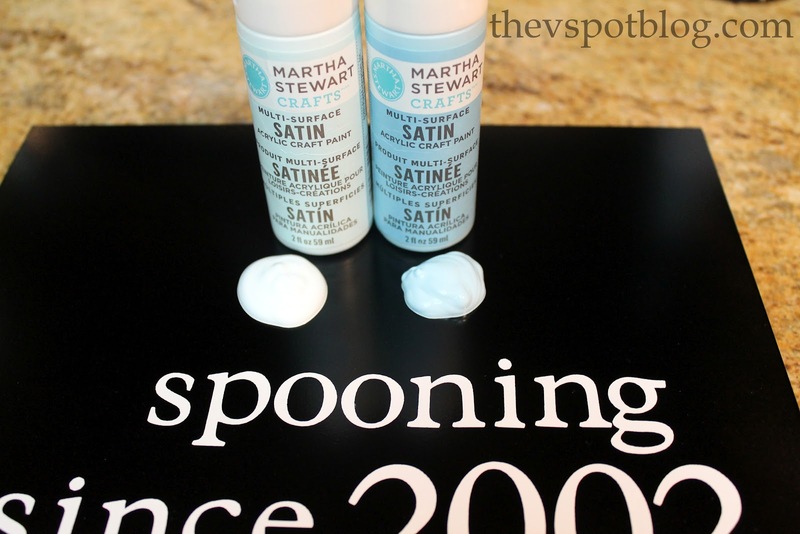 When all of the letters have been peeled away and the paint is dry, apply the adhesive to the lowest part of the back of the spoon (basically where the bowl of the spoon rests when you set it on the table) and also on the back of the handle where it hits the table. 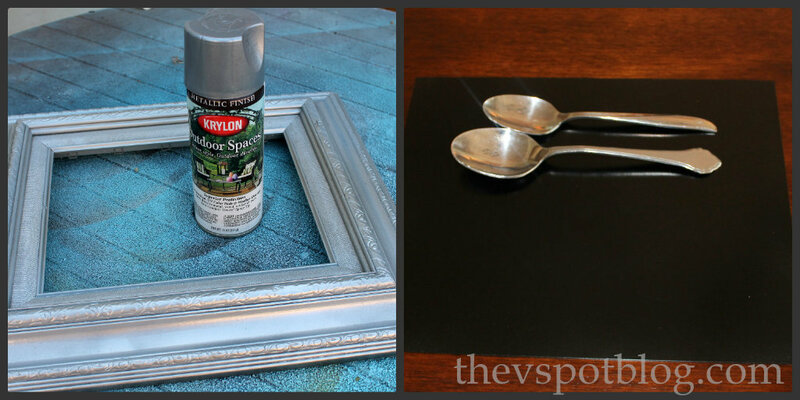 Once the glue is applied to the spoons, carefully position them where you want them and let them sit. I let mine cure overnight, just to be sure it was nice and secure. I love how it turned out. I think it’s fun and whimsical, and it is certainly unique. What do you think? Happy crafting! Ahhaha!! I love it so much! Thanks for the great idea! I think I might do it with forks. Super cute! I would love this with old monogrammed spoons, like the one I had made into a ring! My Anniversary is TOMORROW and I have old monogrammed spoons! Perfect timing!! 🙂 it’s adorable! i’m so going to do this. Ahhh! I love it–so stinking creative!!! LOVE LOVE LOVE – that is too cute! Soooo cute! I love this idea. Pinned it! 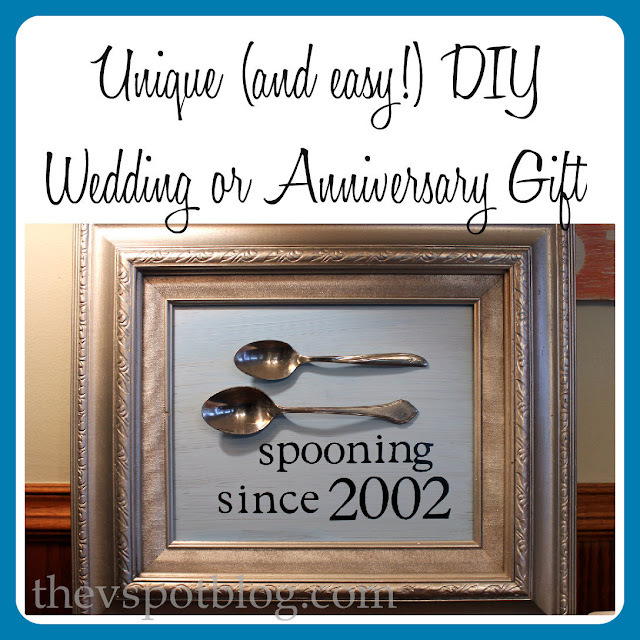 Don’t have a cricut so I’m going to print the words using black ink on white card stock, glue on the spoons, and frame it in a shadow box. May not look as sharp but I won’t have to dust the spoons! This is adorable. How clever and unique. Great job! I think it’s hilarious! I have a friend who’s getting married in a month and I can’t make the wedding. She’s just goofy enough to enjoy this too. Thanks so much for sharing the idea! I absolutely love this! I have just the spot to add one to our home, thank you so much for the inspiration!! This is absolutely adorable! I just saw Karianne did one almost like it, and so wished I would have seen this inspiration before our Anniversary in May. Maybe next year:) I have to pin it to remember. I don;t know how I missed this post- but it is just darling!! What a great idea! Okay I’m trying not to leave you a raving comment about how frustrated I am after trying to recreate this as an anniversary present for my sister, but I’m on a tight budget and just spent that said budget on the supplies for this. After waiting for the acrylic paint to set I pulled off the letters only to have the layer of black spray paint and much of the surrounding acrylic paint peel off as well, leaving a clear spot of glass where my letters should be. Was I suppose to paint one side black and then use the acrylic paint on the other side? If so, your tutorial did not specify. Or perhaps I should have let both the black spray paint and the acrylic paint dry longer? I don’t know… but I’m very disappointed. I cannot wait to make this for my daughter’s shower! Love.love.love! Great blog too! How can you this much creative?Awesome idea and in a less span of time!!! !Definitely want to try this because it’s an affordable rate. I am making this as we speak for mine and my husband’s anniversary. He loves my corny projects; thanks for posting!!! I am going to do this as décor for my kitchen. 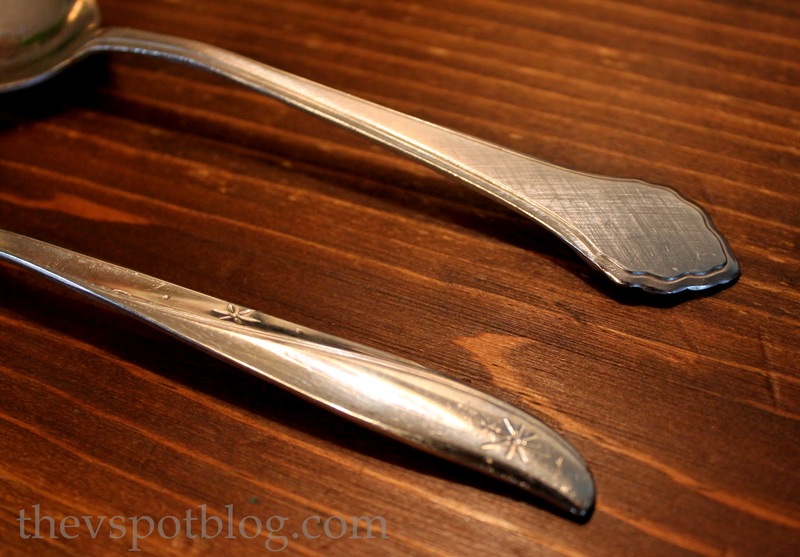 I would like to make a frame with my son’s baby fork in it and put it right below the spooning one. I need a cute saying though. 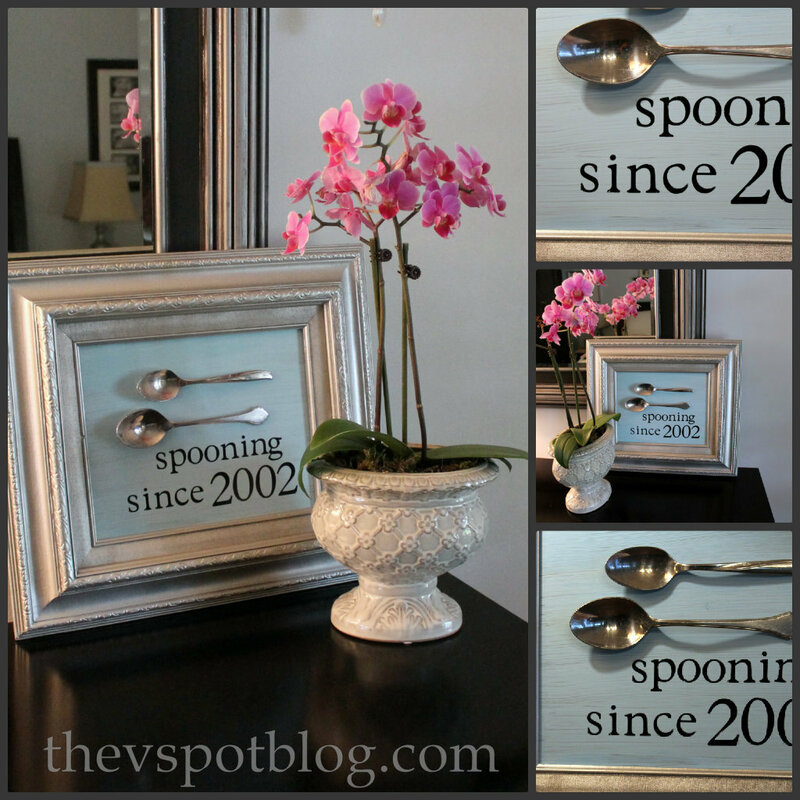 I thought of putting “Spooning since 2005” on one and putting “Forked in 2008” on the other one for my son. what size is this? An 8×10 or 5×7? Hi Amber, it is an 8 x 10. Too cute! What size letters did you use? That iis a very good tip particularly to those new to the blogosphere. Shrt but very accurate info… Thanks ffor sharing thijs one. If not, then just how much will the company chaarge you foor where your gift is going*When will your ift arrive. This article provides some golf presents, and explains using some common golf accessories that may be seent as gifts. This is an AMAZING idea! Thank you so much for sharing and thanks for the inspiration.